Sorry for lack of posts | Russell King, M.E. I started this blog when I was working for myself. A couple years ago I got a “real job” working for someone else because I had a son in college and another one getting ready to go and I needed a more steady and reliable income stream. I have not had the time to create new blog articles and I’ve barely had enough time to reply to the comments on the existing articles. I was going to take the blog down, but people seem to still find some use in it and it still gets 10-20 hits per day. If you leave a comment asking a question, please know that it may be a while before I get to it. Also, please be aware that as a consultant, I sell my time. A lot of comments I get are basically people asking me to design all or part of their system for them (for free). I probably will not reply to those. Sorry. 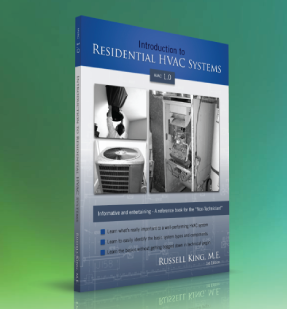 For more information on the topic, I encourage you to check out my book: HVAC 1.0 – Introduction to Residential HVAC Systems. In California, our utilities are excellent resources for training. Check them out. If your specific utility doesn’t offer it, try one of the others. You may have to travel a little bit, but they are usually free or very cheap and open to anyone. Thanks for all you support and positive feedback. air seems to be moving way too fast for any diffuser. .culprits are single feeds off of each side plenum, 8″ round ducts and short 10-12 feet runs. simple fix : lengthen runs? bigger ducts? The quick and easy fix is to put in-line balancing dampers right where the 8″ ducts come off of the plenums. The further away from the register they are, the less likely the are to be noisy or create pressure in the ducts. The problem is that it is very likely that your entire duct system is undersized and causing your fan to work against excessive pressure. This reduces overall system capacity and efficiency. Static pressure across the air handler should, ideally, be no more than 0.6″WC (inches of water column). This is an easy test for a technician or HERS rater to do. If your system is much higher than that, which is extremely common, putting in the balancing dampers might improve your small problem but just make the big problem worse. The best way to fix the problem is to increase the flows to all the other rooms by REDUCING the pressure to the farthest rooms (make the ducts bigger). You may still need the balancing dampers, but the overall improvement should be good. Lastly, it also helps to replace older/cheaper “stamp-faced” registers with “bar-type” registers. They cost a few bucks more, but are much quieter and are rated for twice the airflow. Compare a Shoemaker 845 3-way stamped register to a Shoemaker 950 series registers, for example.